Are you puzzled by which dog toys Australian Shepherds like to play with? This stunning looking breed is a natural herder and is happiest when playing games that involve moving around. Playing games using toys that act as fetch items such as sturdy balls are fun, exciting and helps burn a lot of energy for extended periods of time. So look for rope toys, balls, kongs and stuffed toys. We’ve compiled 5 of the best dog toys in various styles that are sure to entertain your high-energy Aussie ﻿﻿dog for hours. We recommend these toys since many we've tried and tested ourselves and can promise you first hand it will keep your pup happily entertained and challenged! West Paw Design's Zogoflex Zisc Guaranteed Tough Flying Disc Dog Play is a popular option for active Aussies. It has stellar ratings on Amazon as it manages to keep nearly all dogs entertained. It is 8'' in diameter so your Aussie will be able handle it pretty well. 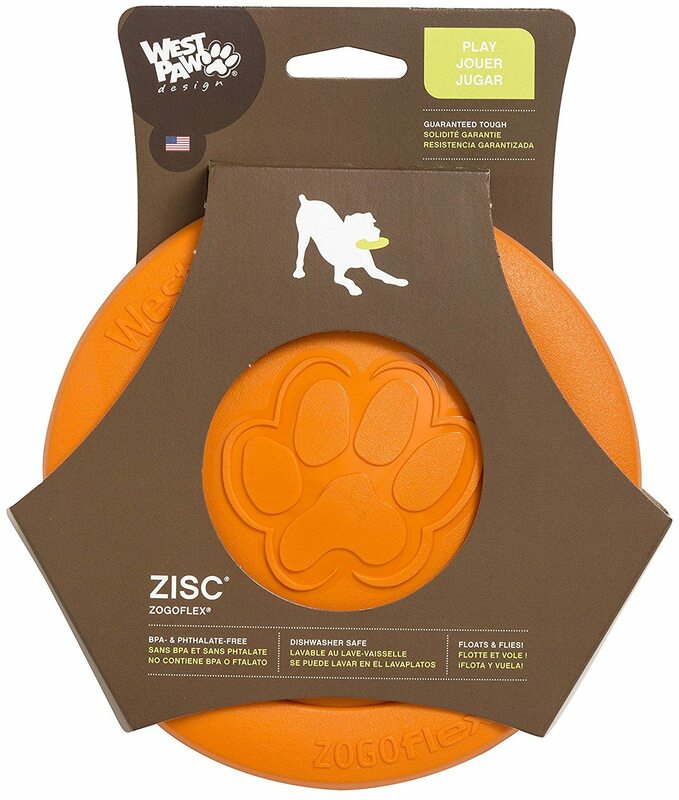 The material of the disc is soft and flexible which will be easy on your pup's teeth and gums. If your Aussie loves playing frisbee then this is the ideal toss toy for retrieving. Made in U.S.A., the Zogoflex is a guaranteed tough dog toy and which flies far, something all pups enjoy! Comes in two sizes: mini and large and various bright colors. This is a "must have" toy to help your Aussie develop its mental physical and emotional capabilities but also to help them expend their high levels of energy. The Kong Dog toy is well known for its durability and thus great for a powerful dog such as the Australian shepherd making them one of the best dog toys for aggressive chewers. 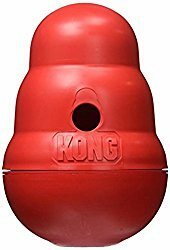 The KONG is a tough, hollow, rubber cone which can be stuffed with treats or kibble and will keep your dogs busy for hours. This toy is truly a life saver for many owners! This is a great chew rope toy for your Aussie dog; they are durable and come in different sizes to suit either adults or puppies. Great for tug of war games, fetch or a serious chewing session. We like this rope bone because it is free from unnatural chemicals as it is made with natural cotton and dyed with vegetable dyes making it both eco-friendly and harmless. 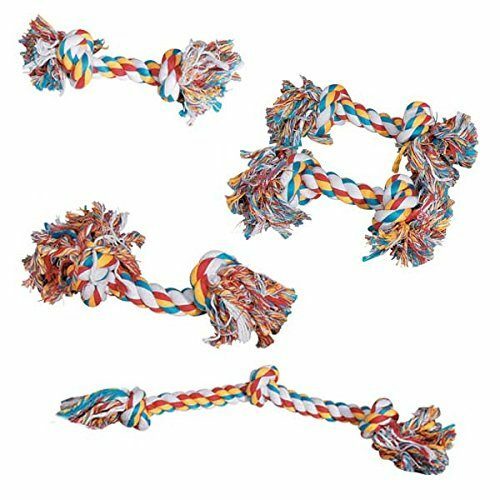 When it comes to the best rope dog toy, we highly recommend this one! This colossal caterpillar 35 inch chew toy is another excellent option. The toy is double- stitched for longevity and is soft and plush. It comes in some really bright pastel colors with 9 squeakers and 1 large grunter and will keep your Aussie dog well entertained for many hours! Throw it in the washing machine when you need to clean it! As the Aussie is a highly active breed playing fetch is arguably the best method of play to keep them engaged. To stop your arms from getting tired this automated throwing toy is an essential in many owners’ dog toy arsenals. Launches a standard sized tennis ball 10, 25, or 40 feet all with the touch of a button. It works via an internal rechargeable battery. The device stores up to five balls and can be easily worked out by your dog how to re-load the machine once balls are dispensed. Comes with 3 non-abrasive, standard sized tennis balls, about 2.5” diameter but the device can use other similar sized balls. It also comes with a 6 months warranty. The perfect companion for an Aussie dog! If you are looking for some great toy ideas for your Aussie﻿ then our suggestions above will ensure your pup remains both mentally and physically challenged but also thoroughly amuse and is a good starting point for you. As you probably know by now the Aussie is a very active breed with a lot of energy to burn so finding the right dog toy can literally be a life saver for some pet owners! To keep your pup engaged we recommend to have lots of dog toys and various types, but to use only 2 - 4 at a time and rotate them out every few weeks. You may also consider t﻿﻿raining ﻿﻿your Aussie to play competitive dog sports. This breed has lots of energy and will enjoy chasing discs and fly balls over an obstacle course. Finally for indoor toys look for stimulating puzzle toys to keep them busy for hours - a better alternative than biting your sofa. 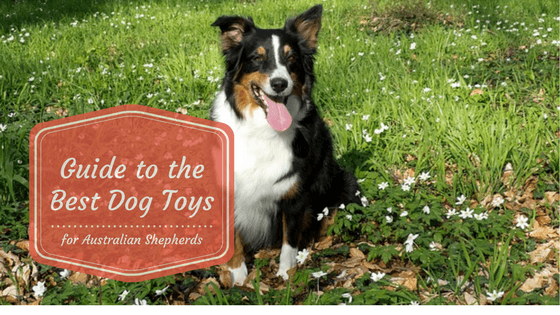 What Dog Games Do Australian Shepherds Like to Play? This herding breed﻿﻿﻿﻿ is naturally athletic and requires considerable daily activity. This breed needs to run around, fetch and enjoy long hours of running outdoors in order for them to be satisfied. What this means is that taking your Aussie dog for a slow stroll around your neighborhood may not be enough to keep them challenged. The Australian Shepherd dog enjoys playing challenging games such as a running down an obstacle course or running around to fetch various playing items. This will help drain their energy levels meanwhile providing mental stimulation. The age of your pup should also determine their playing preference. For instance, Aussie puppies should not be made to run on hard surfaces or to jump over long obstacles as this can cause injuries and harm their joints. Senior dogs may also be uncomfortable with strenuous exercises that threaten their well-being, in this case consider an indoor dog treadmill to get their walks at their own leisure. Aussies also enjoy playing mind stimulating indoor games. So when you don't have time to run outdoors you can still keep your pet satisfied with indoor games that stimulate its mind. This is important to ensure that your pup doesn't go overboard and destroy your furniture in the name of playing. This is an exciting game that lets your dog run at full speed then fly through the air in an effort to catch a flying disc. A successful catch often brings pure joy to your dog. The game is best for practicing obedience command as the dog has to catch the disc and bring it back to you. To get the best out of your Aussie pup ensure that you get a durable disc to withstand these magnificent athletic dogs. The agility game is an interesting game which involves running along a course with a number of obstacles. In its purest form, a dog playing the agility game will be required to run along a course with a number of obstacles such as jumping over barriers, and in tunnels, while the owner runs along with their pup. This game is quite helpful as not only will it help reduce their high energy levels but will also help them practise self-control and obedience command. The Australian Shepherd is a large dog with lots of energy originally bred in Spain for herding sheep. It enjoys playing lots of games especially those that involves running around. The best dog toys for Aussie dogs to keep in your arsenal must be tough and durable such as KONG Dog Toy and Zogoflex Disc to name a few. The Aussie is also fond of dog games that keeps them mentally stimulated. These toys will not only fulfill their instinctual needs, but will also keep them happy and ﻿﻿healthy. And who wouldn't want that for their dog?